If you are looking for quality beauty equipment for your salon then you understand how important dryer chairs are for the success of your salon. 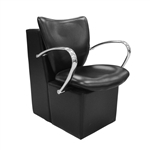 For a diverse selection in salon hair dryer chairs from well known manufacturers turn to Source One Beauty. The right hood dryer chair will add not only a bonus feature but also class and sophistication to your salon. The best hair dryer chairs in the market offer comfortable seat cushions, armrests and match the theme of your salon with multiple color choices. Our dryer chairs are built to last with a sturdy frame, allow for custom selecting your own colors and will fit all standard hood dryers. We carry brand names like Global Salon & Spa, Paragon, Creations and more.